Baby it’s cold outside. Let’s make soup! Posted on January 20, 2019 | Comments Off on Baby it’s cold outside. Let’s make soup! 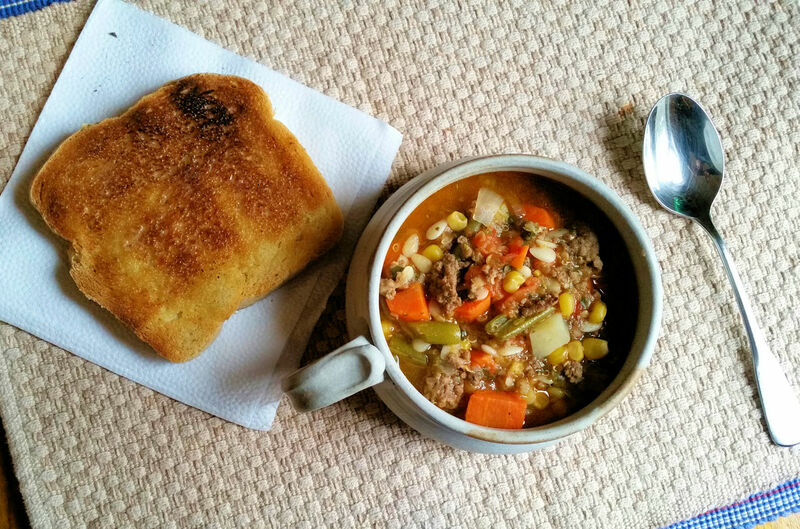 Homemade beef vegetable soup and homemade bread slathered with butter. Perfect meal for a chilly day. A nasty weather front barreled down on us yesterday. Rain for several hours. Then a drastic drop in temperatures, the winds picked up and came at us from the northeast, and all that rain turned to ice and snow. What to do? It should be no great secret that in this house with two cooks, we make a lot of soup. 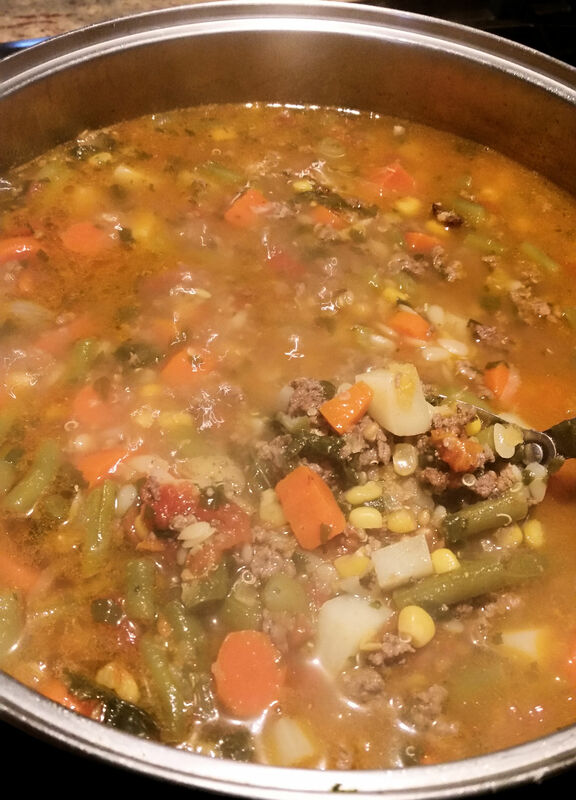 It was my turn today and I decided to make a hearty beef vegetable soup. There is a big difference between soups and stews. Stews are thicker with larger pieces and fewer vegetable varieties. Minestrone soup is a whole different thing; usually two kinds of meats, different vegetables, and cooked in a different manner. Today’s beef vegetable soup started with a shopping trip to the freezer, We plant a large garden and put up a quantity of vegetables. 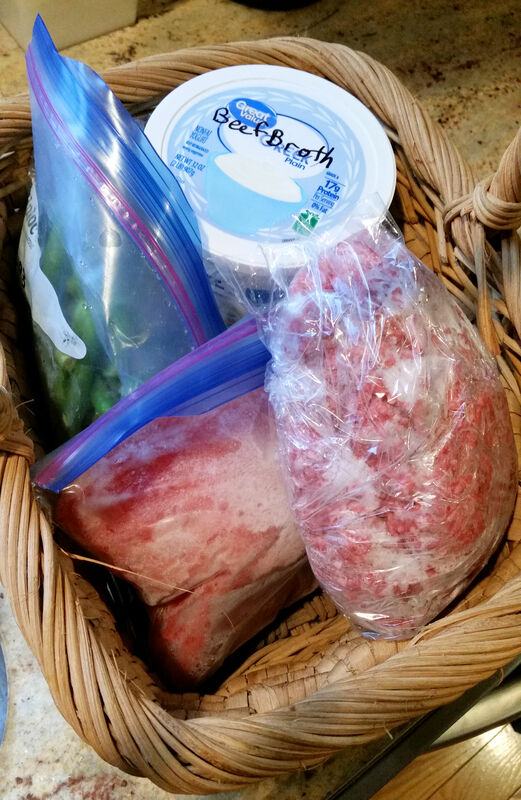 This trip netted diced tomatoes, green beans, ground beef and homemade beef broth. Shopping basket from the freezer. 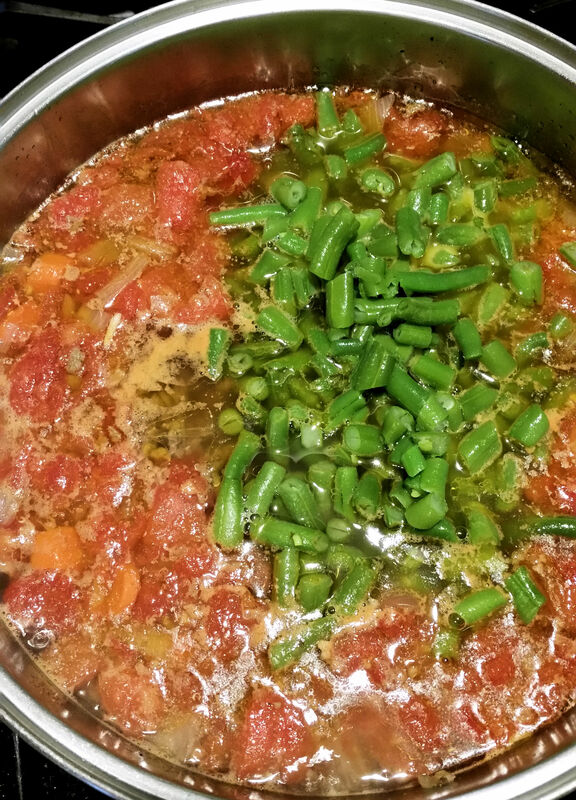 Ground beef, homemade beef broth, diced tomatoes, green beans. Homemade vegetable soup can have many varieties and even mine are not exactly the same each time. ; it depends upon what I have on hand. I usually chop the vegetables pretty small so they are similar in size and will cook the same. I used a six quart pot but we often use a very large soup pot, 10 -12 quarts. This is what I put in today’s special. A couple handfuls each of quinoa, lentils, and orzo pasta. I would have used alphabet pasta but was out. Any kind of tiny pasta or even broken spaghetti or noodles will work. Step 1: Brown the beef in a couple of tablespoons of oil, breaking it up as you go. Then drain any fat off. Step 1: Add the chopped onions and carrots. Carrots take a long time to cook so they get added near the beginning. Stir until softened. Step two. (Step one is just browning the beef in a couple of tablespoons of oil. Drain any fat off after the beef is cooked.) 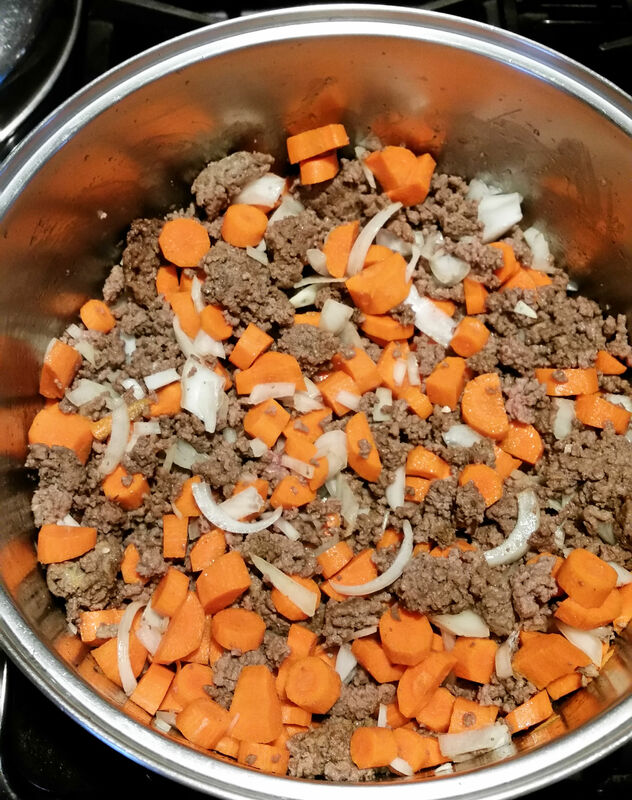 Carrots and onions are added at the beginning as they take longer to cook. Step 3: Add the beef broth and beef cubes. Add diced tomatoes, bring to simmer. Step 4: Add a few handfuls of lentils, quinoa, and tiny pasta. Don’t use larger beans unless they’re canned or pre-cooked. They won’t cook in time and no one likes crunchy beans. Step 5: Simmer and stir. Step 6: Add green beans and corn. Cabbage or in this case, kale. Bring back to simmer. Step three. After the diced tomatoes and handsful of dried goods (lentils, quinoa, tiny pasta) have come to a boil and simmered, then add the chopped green beans, corn and finally the potatoes. Let it all simmer until done. Step 7: Add chopped potatoes and then let simmer until all the vegetables are done. Serve with some homemade bread. Yummm! Beef vegetable soup, final. It is thick but not thickened like stew. Very hearty! This freezes well but I don’t think we’ll have much left over. And I’ll have to keep my husband from giving it all away as he is apt to do. He’s a very generous person. We’re hunkered down and holding our own against the storm. What’s on your menu these days? Comments Off on Baby it’s cold outside. Let’s make soup!